Anita Desai is one of the leading literary fiction artists in India today. Her novels have made a couple of time to the Booker shortlist, though she never won one. 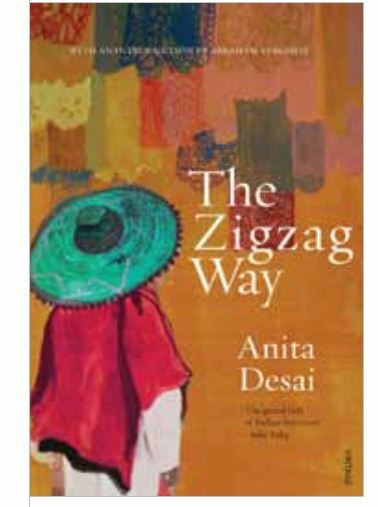 Recently her novel ‘The Zigzag Way’ launched in 2004 got a fresh makeover. No, this is the same novel. Only the cover has changed. The publishers have launched it with a new watercolour cover. The story of The Zigzag Way goes like this: Eric is a buttoned down Boston boy, considered a misfit in his family of hearty fisherfolk. Uncertain he will ever complete the book on immigration he has been funded to write, he impetuously decides to follow his bossy girlfriend to Mexico. There, he is seduced by the pageantry of this colourful new country and its old world charm, and stumbles on an astonishing discovery—his grandfather was one of the Cornish miners who worked the local mines more than a hundred years ago, and once had another wife. Soon, Eric will find himself abandoning his own tentative future project in search of his family’s other lives. Thus, The Zigzag Way is the story of twentieth century Mexico, through civil unrest and personal calamity; the exploitation of the Mexican Indians, and their dubious saviours, such as the formidable, Doña Vera, widow of a mining baron, and Eric’s own grandmother, a young Cornish girl whose grave lies in a cemetery on a Mexican hillside. And in unravelling their dark, often violent, histories, on the Día de los Muertos, the day locals celebrate and remember their dead, Eric comes face to face with his own story, its past and present; even, the afterlife. Haunting and luminous, The Zigzag Way is a magical novel of strange, elegiac beauty. Anita Desai has written numerous works of fiction, including Clear Light of Day (1980), In Custody (1984), and Fasting, Feasting (1999)—all shortlisted for the Man Booker Prize—as well as Baumgartner’s Bombay (1988) and The Zigzag\Way (2004). In Custody was made into a film by Merchant-Ivory productions, starring Shashi Kapoor and Om Puri. Her most recent work is The Artist of Disappearance (2011). Well executed graphic add welcome introductions to writings. This cover emits emotion, bringing a natural interest. I feel graphics adds great dimension attracting readers. Very nice. Anita is an accomplished literary contributor. Always joyful to know.